Prime Minister Shinzo Abe has strong popular support for his economic revival plan. Japanese Prime Minister Shinzo Abe says his country is winning the battle against deflation, the persistent low prices that have plagued Japan's economy for years. "This spring wages will increase, and higher wages will lead to greater consumption," he told business leaders at the World Economic Forum in Davos, Switzerland, on Wednesday. "It is not twilight but a new dawn that is breaking over Japan." He also said he would take on vested interests and act "like a drill bit" to break down obstacles to restoring the country's competitiveness and doubling inward investment by 2020. His turnaround plan for the world's third largest economy -- dubbed Abenomics -- has included new spending pledges and an aggressive, expansive monetary policy. Progress on structural reforms to secure recovery for the aging and heavily-indebted country has been slower. But Abe said he would not let up with initiatives aimed at opening up markets, encouraging innovation and immigration, and transforming Japan's male-dominated corporate culture. "Japan must become a place where women shine," he said, repeating an earlier pledge to ensure 30% of senior positions will be occupied by women by 2020. Abenomics has already had a big impact. Tokyo's benchmark index soared by nearly 57% in 2013 -- its biggest annual rise in over 40 years -- as the yen tumbled against the dollar, helping exporters as Japanese goods became cheaper in foreign markets. Economic growth has also picked up, although a surprise slowdown in the third quarter of last year served as a warning that without major economic reforms, the early success could fade. The International Monetary Fund on Tuesday upgraded its 2014 growth projection for Japan to 1.7%, from 1.4% in October. But growth is forecast to slow again in 2015. The Bank of Japan on Wednesday voted to maintain its current pace of monetary expansion, saying the economy continued to "recover moderately" and predicting that inflation would remain well below its target of 2% for some time. 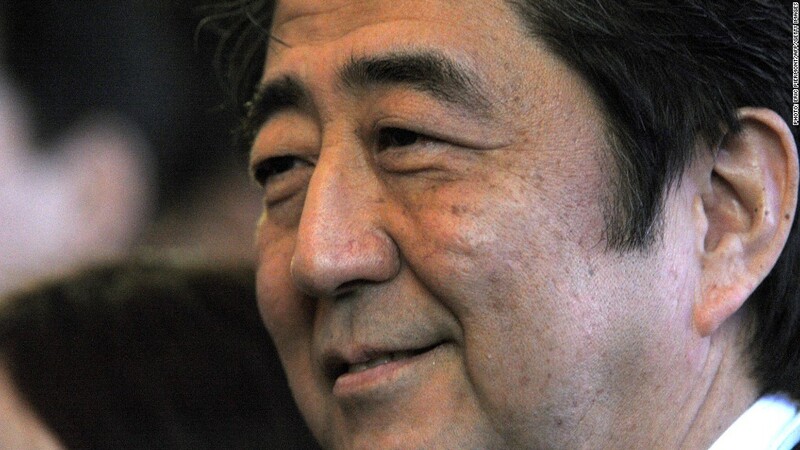 Abe is riding high in opinion polls, with support for his government rising to more than 60%. But voters have more mixed feelings about his December visit to Tokyo's Yasukuni shrine, where convicted war criminals are honored along with other war dead. The move incensed China -- a major trading partner -- which suffered under Japan's military aggression in World War II, and regards the shrine as a symbol of Japan's imperial past. "I have no intention whatsoever to hurt the feeling of the people of China or Korea," Abe said. "The door to dialogue is always open on our side."